Hi, everyone, I’m Ilene. These days I write a lot, mostly about my 18-month-old daughter’s life. She had open-heart surgery at 7 days old and people wanted updates on her condition. They wanted pictures, stories and medical information. So, I started a blog and she has a fan club. Feel free to visit us at Charlotte’s Journey Home. You’ll find that Charlotte is a typical toddler and a real hoot. My husband rushes home each night to help put Charlotte to bed. Every Saturday he sends me away so he can spend special time with Charlotte and I can read children’s books all morning. We all feel so lucky to have each other. Before Charlotte, I worked in marketing. And before that I taught and published as a college professor and independent scholar specializing in film, video and mass visual media. I earned my Ph.D. in Radio/TV/Film from Northwestern University and my AB in Art History and French Civilization from Brown University. Today, I consider myself a “pre-published” author of children’s books. 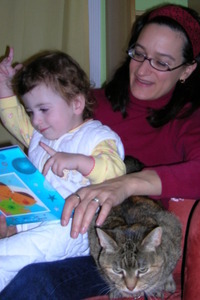 I also muse about life at Charlottesmom.livejournal.com, where I don’t talk about my kid, I promise (well, not much). Mostly, though, I spend my days at the playground or on the floor reading to Charlotte. Can’t think of anything I’d rather be doing! Welcome! Looking forward to hearing from you! Thank you all for your kind welcome. I'm glad to join the conversation!